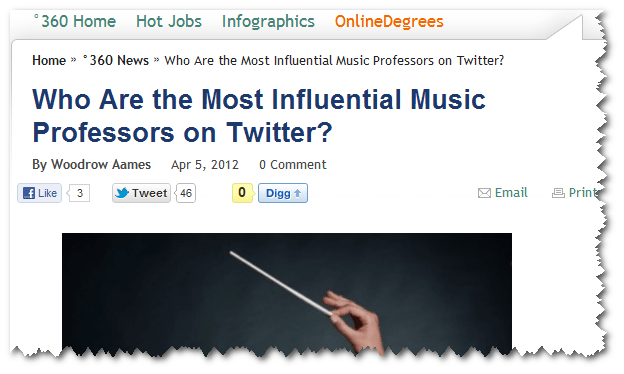 The Degree360 group has created a list of the Most Influential Music Professors on Twitter and I (@pisanojm) am very excited to be listed along with the other selected professors on this prestigious list. I’ve listed the professors here and have also created a LIST on Twitter that you may use to follow them all. @ProfessorFox, Zak Fox Jablow, Professor of Music Business, Columbia University. @mikejjohnson, Michael Johnson, Associate Professor, Berklee College of Music. @TomoJustFunky, Tomo Fujita, Professor, Berklee College of Music. @susancattaneo, Susan Cattaneo, Songwriting professor at Berklee College of Music. @KristinKuster, Kristin Kuster, Assistant Professor of Composition, University of Michigan. @dasmooke, David Smooke, Composer of Experimental Music, Peabody. @DJ_Moderne, Ken Ueno, Associate Professor of Music, UC Berkeley. @eeleach, Elizabeth Eva Leach, Professor of Music, Oxford. @gewang, Ge Wang, Assistant Professor of Music, Stanford University. @christianhowes, Christian Howes, Associate Professor of Music, Berklee College of Music. @cnycafemomus, David Abrams, Professor of Music, Onondaga Community College. @pisanojm, Joseph Pisano, Professor of Music, Grove City College. @BlakeRHenson, Blake R. Henson, Assistant Professor of Music Theory/History/Composition, St. Norbert College. @robdeemer, Rob Deemer, Professor of Composition, SUNY, Fredonia. @johndaversa, John Daversa, Professor of Music, California State University, Northridge. @usmusicscholar, Mark Clague, Professor of Musicology, University of Michigan. @luisalfonsobes, Luis Alfonso Bes, Music critic for The Herald in Spain. @abaumgardner, Astrid Baumgardner, Coordinator of Career Strategies and Lecturer on Careers in Music, Yale School of Music. @PunkProfessor, Vivien Goldman, Professor of Punk and Reggae, NYU. @tburritt, Thomas Burritt, Associate Professor of Music, The Butler School of Music, University of Texas at Austin. @sdbeck, Stephen David Beck, Professor of Experimental Music & Digital Media, LSU. @jdelcolliano, Jerry Del Colliano, Clinical Professor of Music Industry, University of Southern California. @MusicalTravel, David Nelson, Professor of Music, University of North Carolina at Greensboro. @CBCarey, Christian Carey, Assistant Professor of Music, Rider University. @DSmithMusic, Darius Smith, Assistant Professor of Musical Theatre, Howard University. @chloeveltman, Chloe Veltman, Journalist and producer/host of VoiceBox. @EricWhitacre, Eric Whitacre, Composer in Residence at Sidney Sussex College, Cambridge University. @golan, Golan Levin, Director of the STUDIO for Creative Inquiry at Carnegie Mellon University. @masonbates, Mason Bates, Composer-in-Residence with the Chicago Symphony. @richardehaynes, Richard Haynes, Clarinetist with ELISION, Germany. @MC_Conductor, Michael Christie, Music Director of the Brooklyn Philharmonic. @jadashi, Judah Adashi, Composer, Faculty at Peabody Institute of the Johns Hopkins University. @JeffRabhan, Jeff Rabhan, Chair of the Clive Davis Institute of Recorded Music at New York University’s Tisch School of the Arts. @etobias_musiced, Evan Tobias, Assistant Professor of Music Education, Arizona State University School of Music. @StephenWebberr, Stephen Webber, Professor, Berklee College of Music. @ptpattison, Pat Pattison, Professor of Lyric Writing and Poetry, Berklee College of Music. @kgoldschmitt, Kariann Goldschmitt, Visiting Assistant Professor of Music, New College of Florida. @BillCorvino, Bill Corvino, Adjunct Professor of Music, Mercer County Community College. @jsinkovich, Justin Sinkovich, Assistant Professor, Columbia College, Chicago. @LaszloGardony, Laszlo Gardony, Professor, Berklee College of Music. @woodwindninja, Bret Pimentel, Professor, Delta State University. @lennystallworth, Lenny Stallworth, Professor, Berklee College of Music. @leadtromba, Chris Magee, Assistant Professor of Music, Northeast Lakeview College. @BerkmanPIANO, David Berkman, Professor of Jazz Studies, Queens College. @DuaneAMoody, Duane Moody, Associate Professor of Voice, Berklee College of Music. @MWhalenMusic, Michael Whalen, Composer, NYU. @jennifergrim, Jennifer Grim, Assistant Professor, The University of Nevada, Las Vegas. @drkent, Kent Gustavson, Adjunct Professor, Stony Brook University. @MontyCraigMusic, Monty Craig, Professor of Jazz Guitar, Clemson University.